You are here: Home / Blog / General / What can you expect from our Logan auto repair shop? What can you expect from our Logan auto repair shop? We are very proud of our Logan auto repair centre, which offers plenty of elbow room for our mechanics, and our customers really appreciate our friendly customer service as well. With many positive testimonials from our happy customers, it is clear that we are doing something right! Why are we the most popular Logan auto repair shop? There are many reasons why Steve Sorensen Mechanical is the most popular Logan auto repair centre. From our clean and modern auto mechanic shop to our award winning customer service, our upfront and transparent pricing policy and our well-appointed and air-conditioned waiting area, customers keep coming back for all of their services and repairs. Far too often we hear from our customers about a car repair shop that is so dirty that they were afraid to put a foot anywhere, because the floors were covered in oil and other debris. 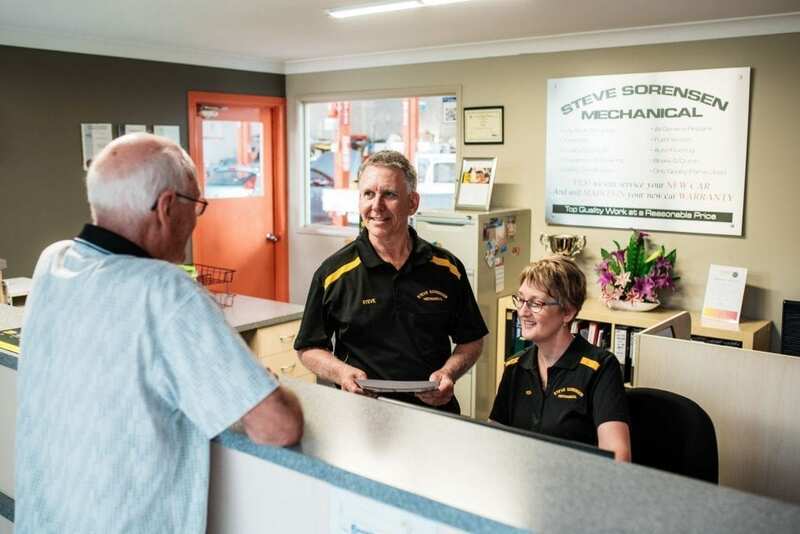 At Steve Sorensen Mechanical, when moved to new premises in 2007, we made sure that we had a design for our Logan auto repair centre that was easy to keep clean at all times. This provides both our mechanics and our customers with a safe and healthy environment, which is something that we believe is essential to the success of our business. We have won the Quest Business Achievers Awards for outstanding service in the Motor Vehicle Sales and Service category consecutively for 5 years straight. As a family business, we go out of our way to greet all of our customers to make them feel comfortable in our Logan auto repair centre. More often than not when you call us on the phone, you will speak to Robyn, Steve’s wife, who manages the office and takes great pleasure in chatting to our customers. All of our costs are upfront and wherever possible, we’ll give you a firm quote for all work. If anything changes and your repairs are going to be more extensive, we always contact you or even invite you down to our car repair shop to show you the problem and get your approval for the work. With air-conditioning and comfortable seating, you won’t see stacks of old, oil stained magazines and dirty cups in our auto mechanic shop. We make sure that our waiting room is well appointed for all of our customers, so that you can wait in comfort while we service or repair your vehicle. Contact us today or we look forward to seeing you at our award-winning car repair shop in Logan. https://stevesorensenmechanical.com.au/wp-content/uploads/sorensen_mech-0003-DK1_1194-1.jpg 1201 1800 Brendan Sorensen https://stevesorensenmechanical.com.au/wp-content/uploads/SS-Logo-1.jpg Brendan Sorensen2017-08-30 06:00:232017-11-13 16:24:00What can you expect from our Logan auto repair shop?